Living Area 2,324 Sq. ft. 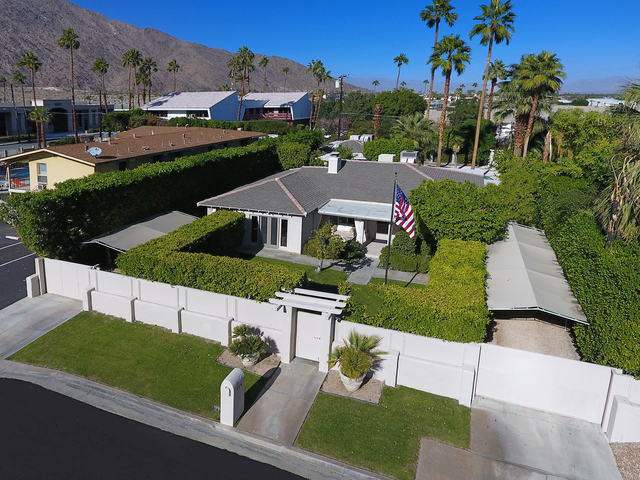 Very charming, private gated compound in Prime Tahquitz River Estates location close to downtown. 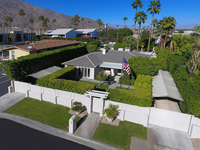 The main house has 2 spacious bedrooms, 1 remodeled bath, wood burning fireplace, travertine Floors, custom window treatments and plantation shutters. The nice kitchen and adjacent breakfast room is near the covered rear patio and pool. A front facing covered veranda overlooks a very private front yard with great mountain views. The west unit is a 1 bedroom/1 bath with Saltillo tiled floors and a small private patio in the rear. The rear house is an unpermitted, but grandfathered 1 bedroom/1 bath unit with Saltillo tiled floors, a large patio in the front and another covered patio area overlooking the pool. The wonderful central pool area, pavilion and outdoor kitchen is ideal for entertaining friends and family and can be shared by all. The swimming pool has been remodeled to a 4’ depth. This is ideal as an owner occupied property with rental income.